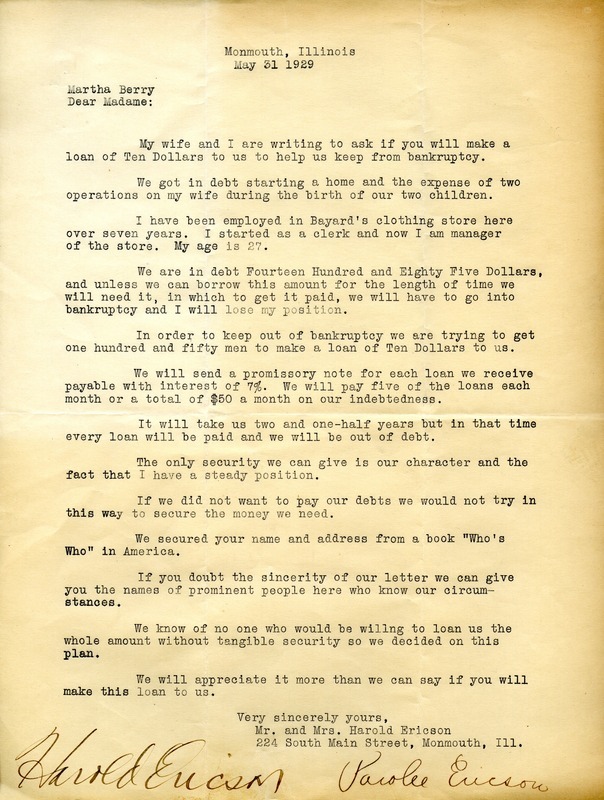 The Ericsons write to Martha Berry asking about a loan to prevent themselves from going into bankruptcy. They lay out the terms of paying back the loan as well in the letter. Mr. Harold Ericson, “Letter to Martha Berry from Mr. & Mrs. Harold Ericson.” Martha Berry Digital Archive. Eds. Schlitz, Stephanie A., Chelsea Risley, Aaron Jackson, et al. Mount Berry: Berry College, 2012. accessed April 25, 2019, https://mbda.berry.edu/items/show/10031.